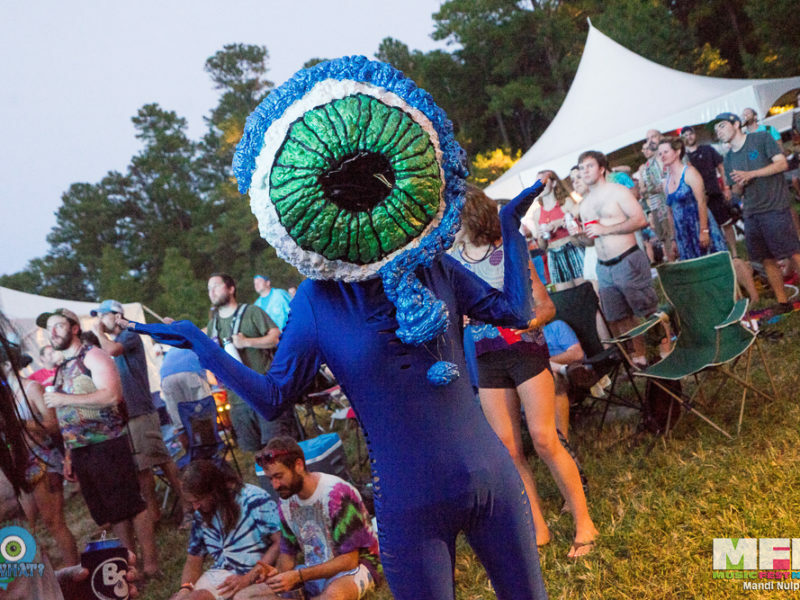 Tropical Heatwave 35: Eight Hours, Ten Stages, 50 Bands! 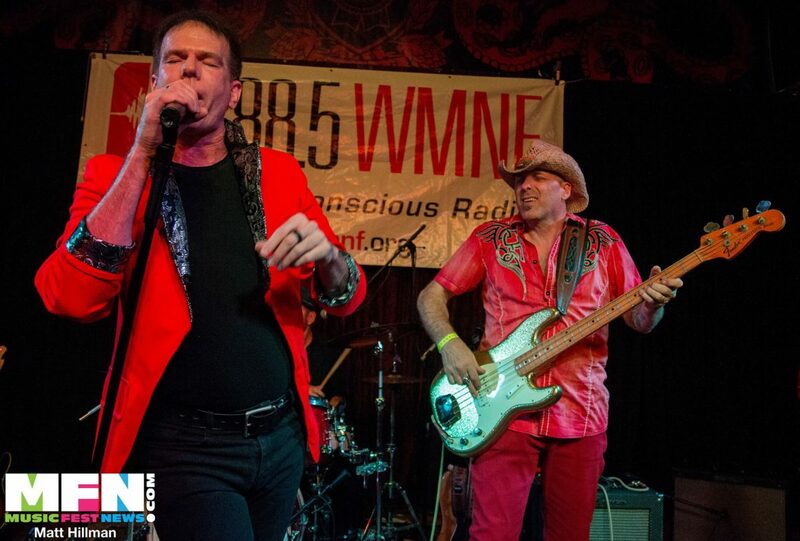 The 35th Tropical Heatwave, hosted by WMNF 88.5 Community-Conscious Radio, swept through Ybor City again Saturday night (April 30). Mother Nature decided to cooperate, making it a lovely night to maneuver among the nine locations where music (and poetry) bubbled out into the streets. 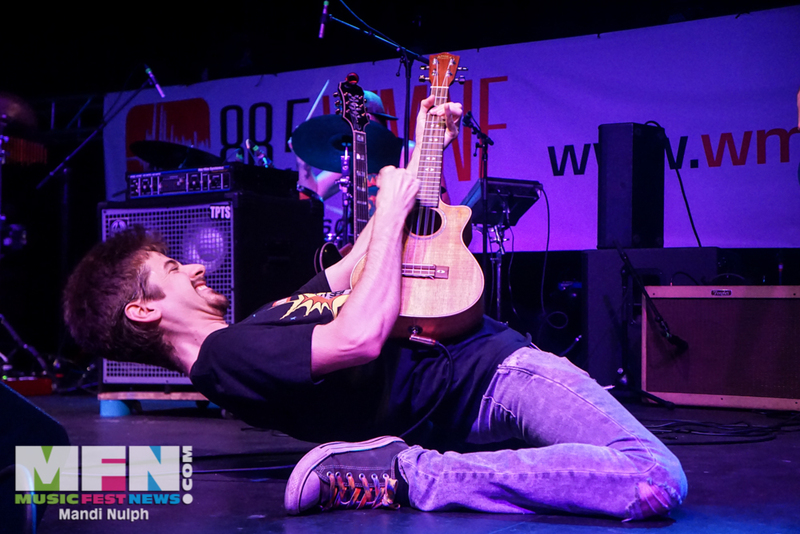 Once again, WMNF brought an incredible range of genres and talents to stages up and down 7th and 8th Avenues. Unlike Heatwaves of recent memory, however, the iconic Cuban Club was not ground zero for the event. The Cuban Club’s decision to hold a sold-out Alabama Shakes show the night before made it logistically impossible to use the former home base. In some respects, the distance between venues was actually shorter, and the effort to get that magical Heatwave vibe without the Cuban Club was excellent. Fans raved about the music at every venue. That isn’t to say that there isn’t room for improvement if, in fact, this is the new Heatwave model going forward. Before we get to the wonderful music, five suggestions for future, my own and those of a number of folks I talked to, in countdown form. 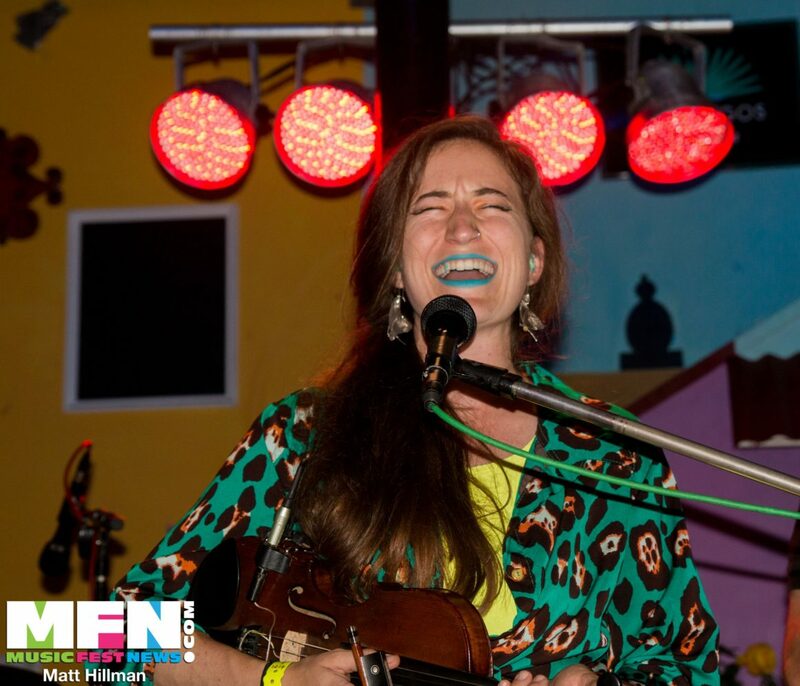 Publish the list of performers for Florida Folk Night (held this year at First Chance, Last Chance Bar). I would have rearranged everything to have seen the Reina Collins Band there. I saw the list of performers — the next day. Invite back the numerous vendors who used to line the perimeter of the Cuban Club courtyard. We missed them at the Tropical Breeze Stage. Also missing at the Tropical Breeze Stage were tables and chairs that many Heatwave veterans had come to expect at the outdoor stage. 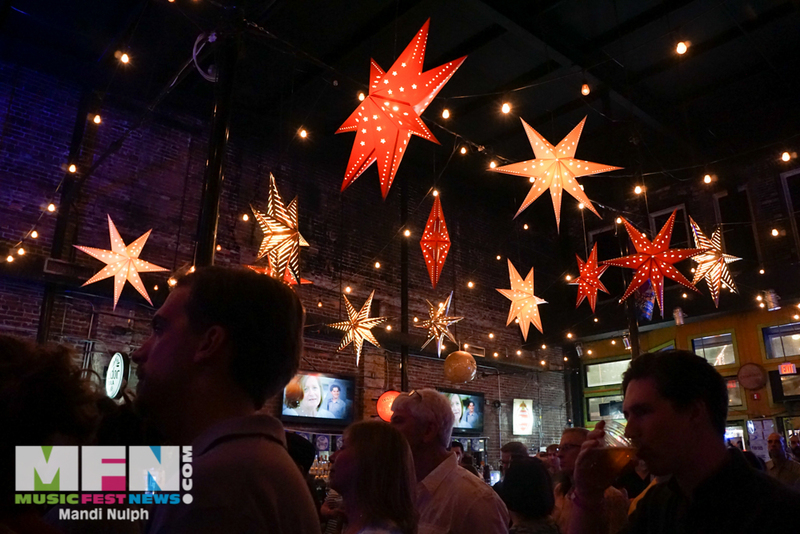 There are lots of food and beverage establishments in Ybor City, of course, but many of us enjoyed the food vendors from local restaurants, and we missed them. Again, this was a different Heatwave, but perhaps a heads-up about lack of food, tables and chairs would have been nice. I could probably get past all of that stuff, but I cannot accept incompetent sound engineers who are certain that, if REALLY REALLY LOUD sounds good, then REALLY REALLY REALLY LOUD sounds even better. I only made it to four venues, and the sound at Cigar City Cider and Mead was good and acceptable at the Tropical Breeze Stage. The sound at The Ritz Ybor was hideous. It was too loud walking up the hallway for the very first band, UNRB, and it was painful inside the main room. Sound can be done properly there; last year it was magnificent seeing Orgōne and Come Back Alice there with a knowledgable sound crew. 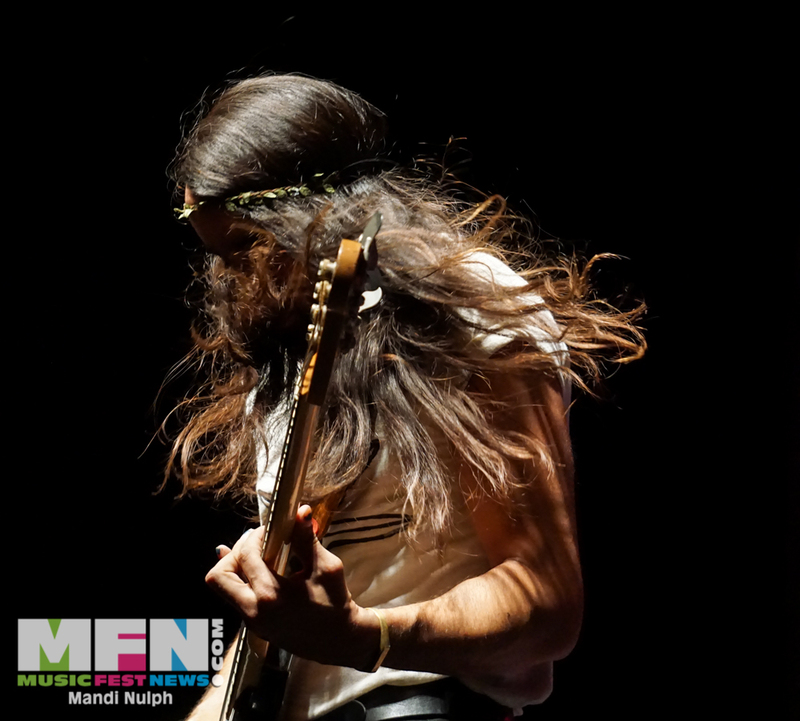 It was still too loud during Trae Pierce’s set, and it ruined completely the set by North Carolina’s The Mantras. Did you know there were actually vocals in that set? Couldn’t hear a word of it. Down the street at Tequila’s, it was also far too loud, although not at the obscene levels at The Ritz. People told me they wanted to hear Acme Jazz Garage, but the levels were way past the comfort zone. I wear earplugs, and it was still too loud. What is a band to do? Arm-wrestle with the sound guy to keep things manageable? What I know for certain is that ear damage is real, and Nigel Tufnel levels aren’t good for anybody. Louder does NOT make it better. 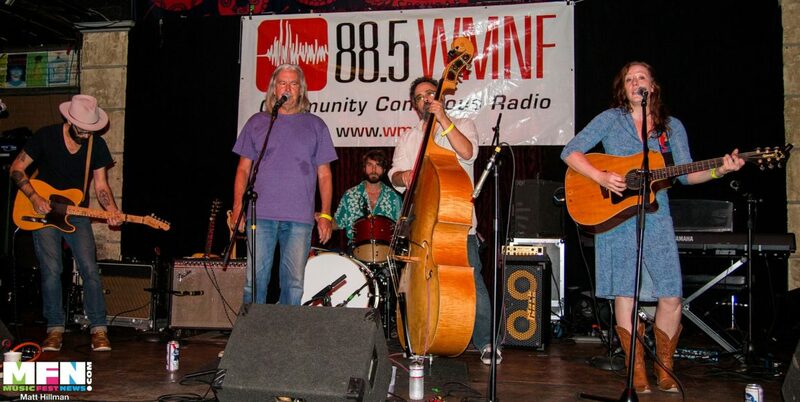 Please let WMNF know if you would like to see volume at reasonable levels. The music, as always, was the main focus of Heatwave (we didn’t get to the poetry slam). We got to hear nine of the 50+ performers, so this is just a small slice of the action. The Kansas Bible Company (from Indiana, naturally) played the Purple Hatter’s Ball last year, and again they were in fine form, the horn section kickin’ it hard at the Tropical Breeze Stage. We wanted a second shot at UNRB, a fine funky ska-fusion band. They were having a great time engaging the crowd, with lots of witty banter, very entertaining. Front man Noel Rochford was a stitch. The music was spoiled by the excruciating sound levels, sadly. 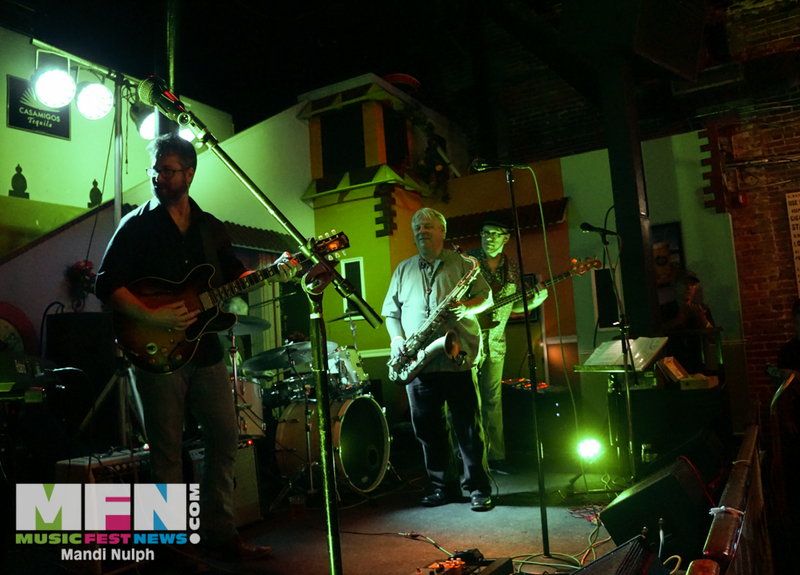 We headed out for dinner, then went back to The Ritz for Trae Pierce and the T-Stone Band. 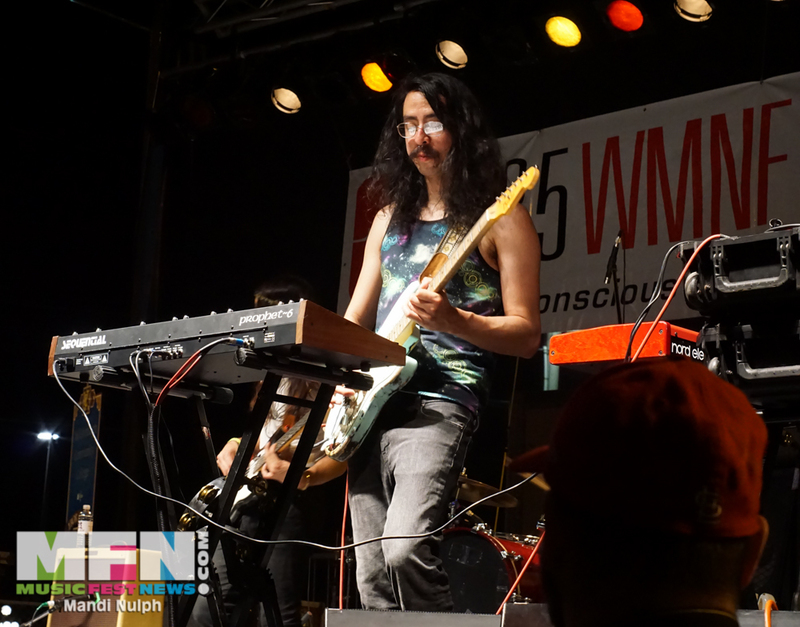 Pierce and Co. had just headlined WMNF’s Little Manatee Jam Fest, and we were excited to get funked up again. Pierce can really mix it up. This show was a bit more hip-hop and a little less funk than last time but just as much fun. We walked in during “No Diggity.” They threw in “Rock and Roll, Part 2,” “The Star-Spangled Banner” and more, with son Rae leading the crowd. Charron Freeman again killed it on bass alongside Pierce and his bass. 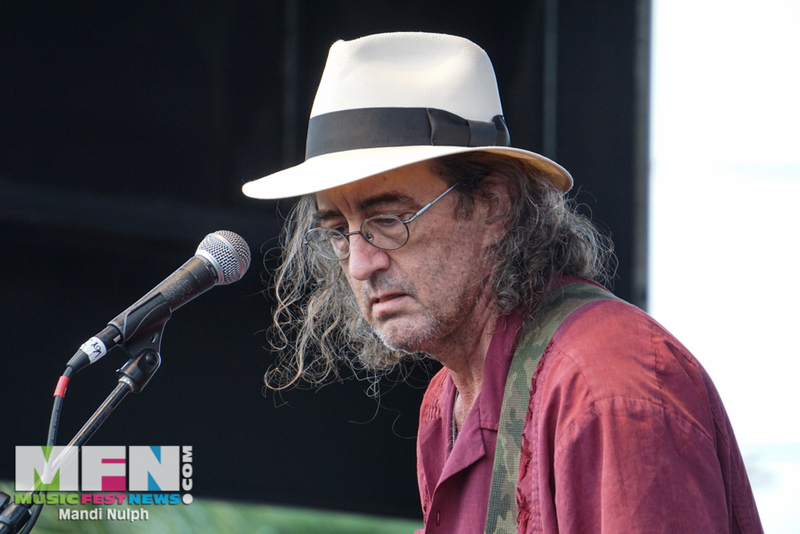 James McMurtry, the superb Austin storyteller, was holding forth at the Tropical Breeze Stage, his wry humor and the band’s excellent performance intertwining. We only got to hear the end of his set. 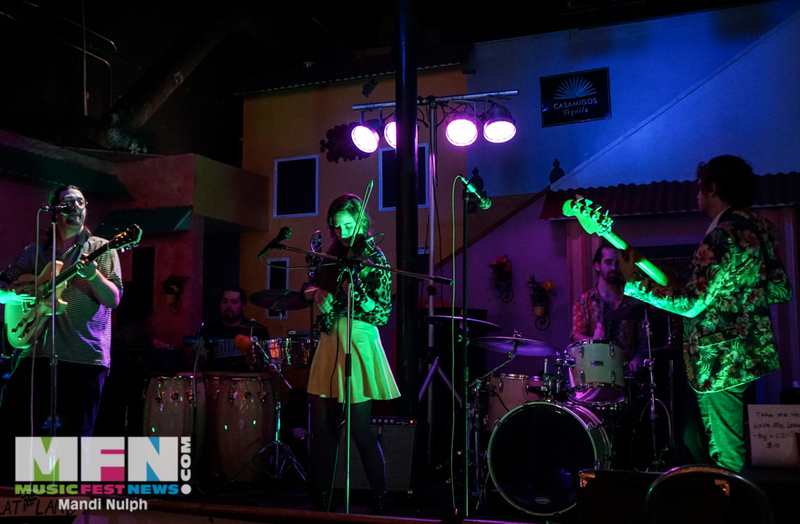 We headed to Tequila’s to check out The Get Right Band on Sam’s recommendation. The Asheville trio were working on a nice ska ballad when we arrived. Then the jam hit, and it hit hard, some really nice, spacey stuff. It was too loud, but not overwhelming. Yet. We had to move around the corner to meet with others in our small party at Cigar City Cider and Mead. Grant Peeples was entertaining there, his stories full of colorful language and images, to everyone’s delight. To my delight, I discovered that the establishment is owned by Jen Sladky, a former student and an excellent bass player herself. Brava! We slipped back to let our friends hear The Bright Light Social Hour, and they tore up their last song, a cover of The Who’s cover of Mose Allison’s “Young Man Blues.” That was HOT! We went back to The Ritz, not realizing that time had gotten really fouled up because of Mingo Fishtrap’s late arrival. They were jut finishing as we arrived, knocking out a great “Sledgehammer.” We sat (what a lovely luxury) and talked, waiting for The Mantras. They began 35 minutes behind schedule due to no fault of their own, and their set was cut short to keep things on schedule. But none of that was as bad as the just plain lousy sound in the hall. They can out slamming, and it was powerful but nearly unbearable sound-wise. Vocals were unintelligible if audible at all. After the blistering start, they backed off — slightly — before hitting a deep, deep groove, followed by some wicked prog. The bad sound aside, this was the most riveting performance we saw all night. We split right after they played “Life’s Been Good” to head back to Tequila’s. Because of the time foul-up, we were able to hear just the last two songs by Acme Jazz Garage. This outstanding quartet from the Tampa area was hampered by volume much too loud and unnecessary, but their playing was great, first a cover of “Watermelon Man,” with lots of fun twists and turns, and then a great reading of keyboard player Bryan Lewis’ tune “Resonance” from their new self-titled album. Matt Swenson rises to the top of this one on guitar, and he was superb. 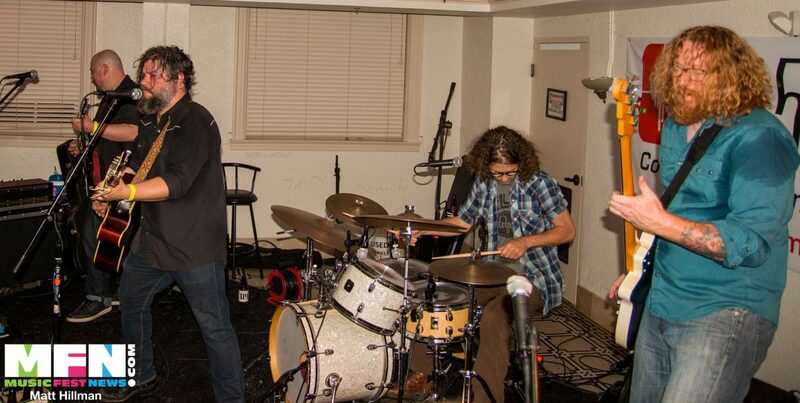 Philip Booth and Tim Diehl anchored the proceedings on bass and drums with flair. That left it to Flat Land to close down the evening. This is a band that has so totally captivated me that I have seen them 15 times in the past 15 months. 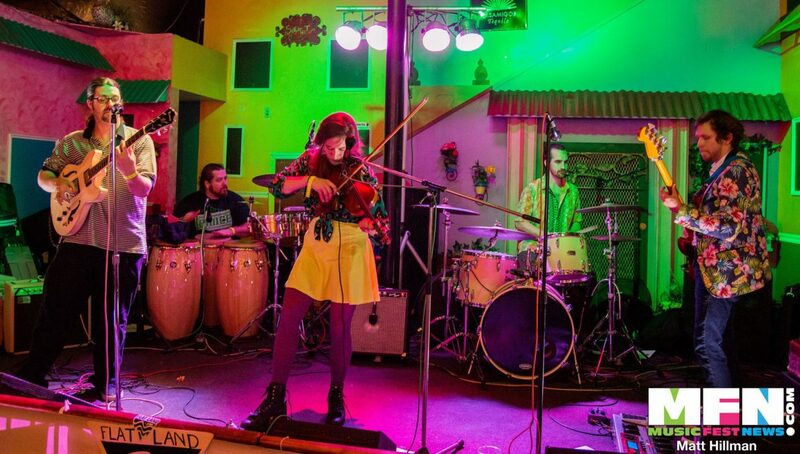 The visual focus is on Fae Nae, who sings, dances and plays a wicked violin. Her pop art/op art outfits are the perfect complements to her incredible performance. 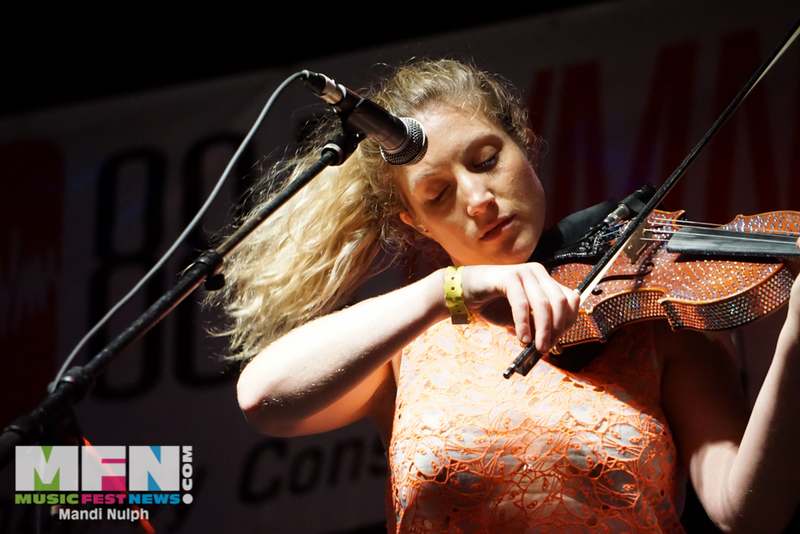 She has a fascinating phrasing style and is one badass violin player. 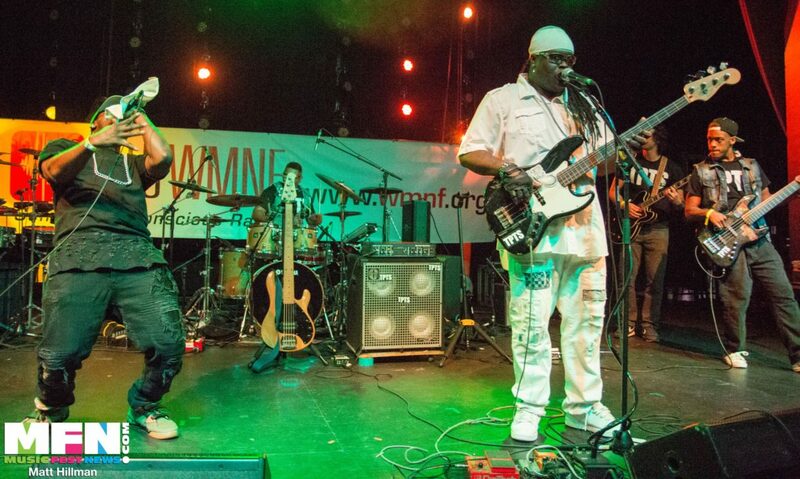 The band’s self-description of “ethereal funk fusion” is accurate on all three counts. 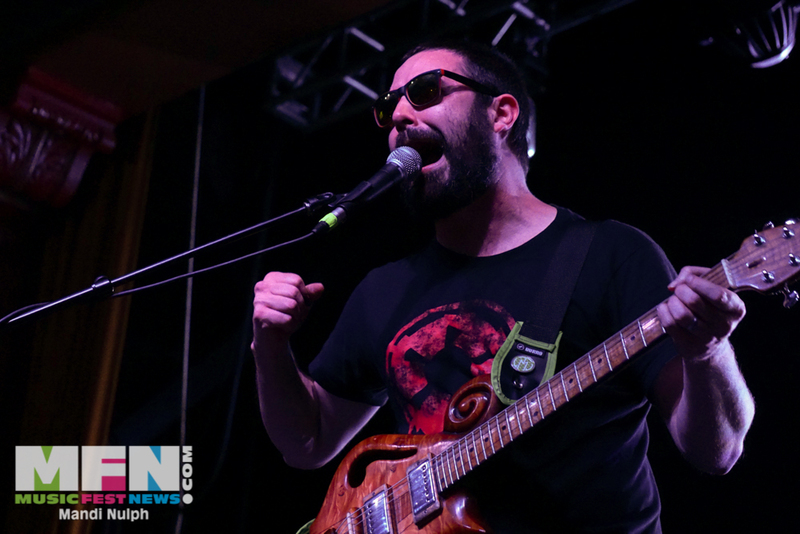 Fresh off a main-stage set at the Okeechobee Music & Arts Festival in March, Flat Land had the controls set at warp speed, blowing up a tremendous show (despite the lousy sound). They opened with “Cosmifunkpop,” which was their previous self-proclaimed genre, but this set went in lots of great directions. 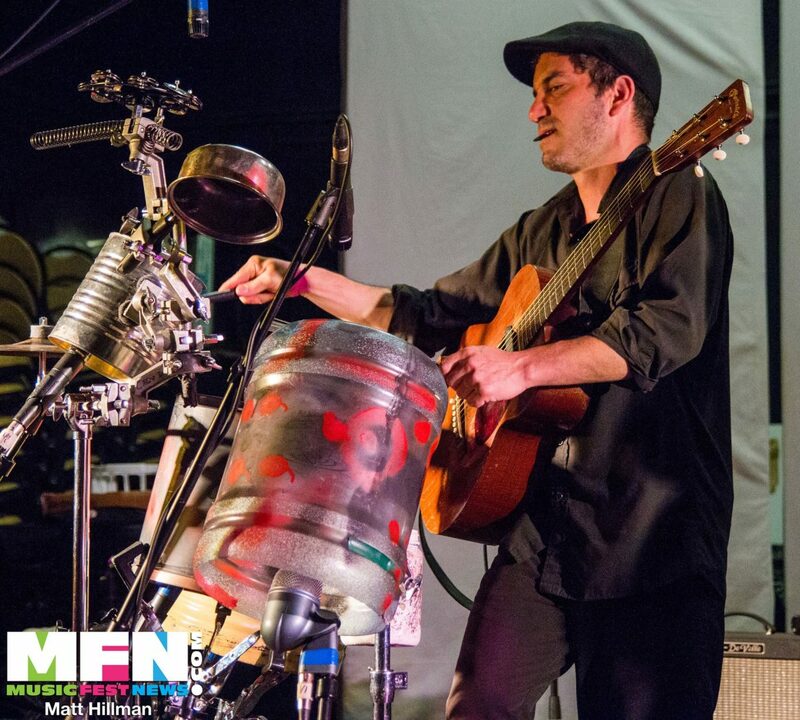 There is a distinct Latin feel to songs such as “Back Pocket” and “Poco A Poco,” Grant McLeod on drums and brother Ian on percussion driving the beat. MusicFestNews writer/photographer Mandi Nulph recognized bassist Brandon Miller’s funky jacket from their Okeechobee set! Miller had an excellent night. Flat Land’s funk is deep. 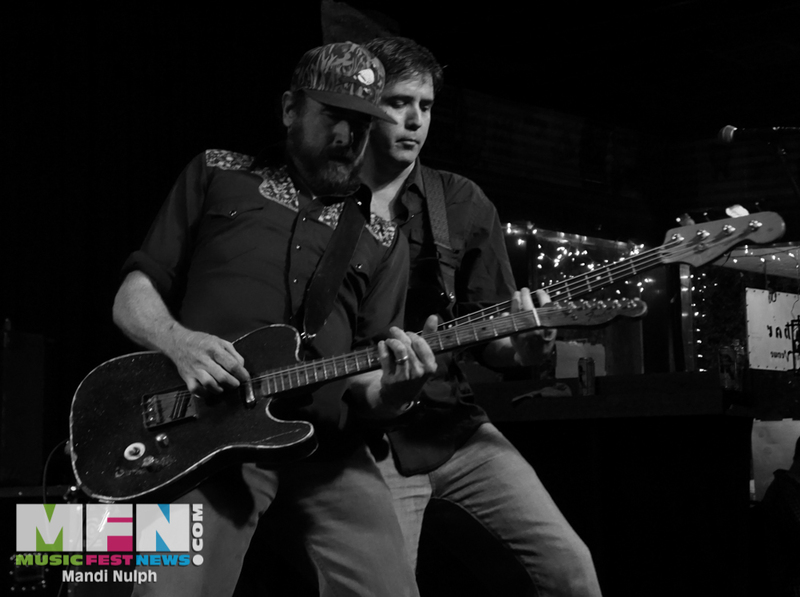 With the bottom end firmly in place, the real heat occurs when Fae Nae and guitarist Chris Storey square off, and they did so often. 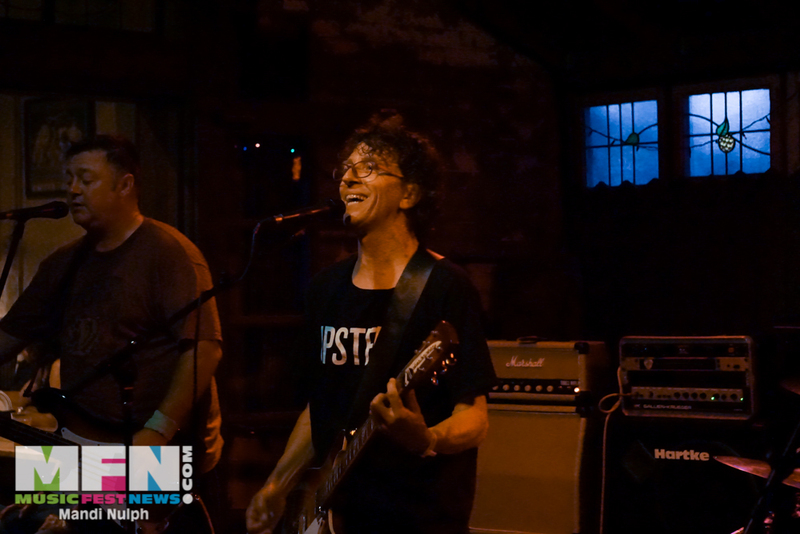 The electrifying set closed with a great cover of “Ramble On,” followed by the finest song from their EP, titled “Ruffio’s Last Stand.” Earlier, Fae told us the band was mixing their first full-length album this week, with a release date scheduled for June. 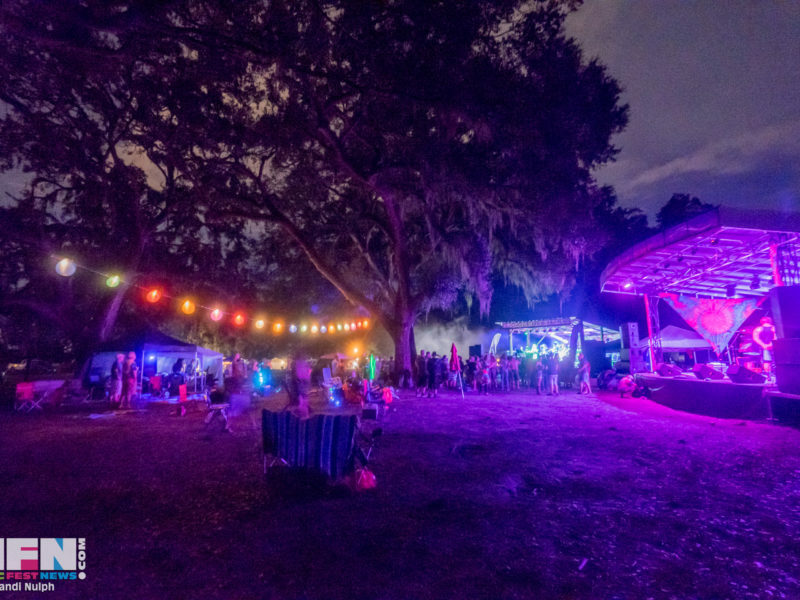 One of the things I truly enjoy about WMNF’s Tropical Heatwave is they bring out a lot of acts that I wouldn’t normally see but that I get absolutely floored by. One of those great surprises was The War and Treaty. 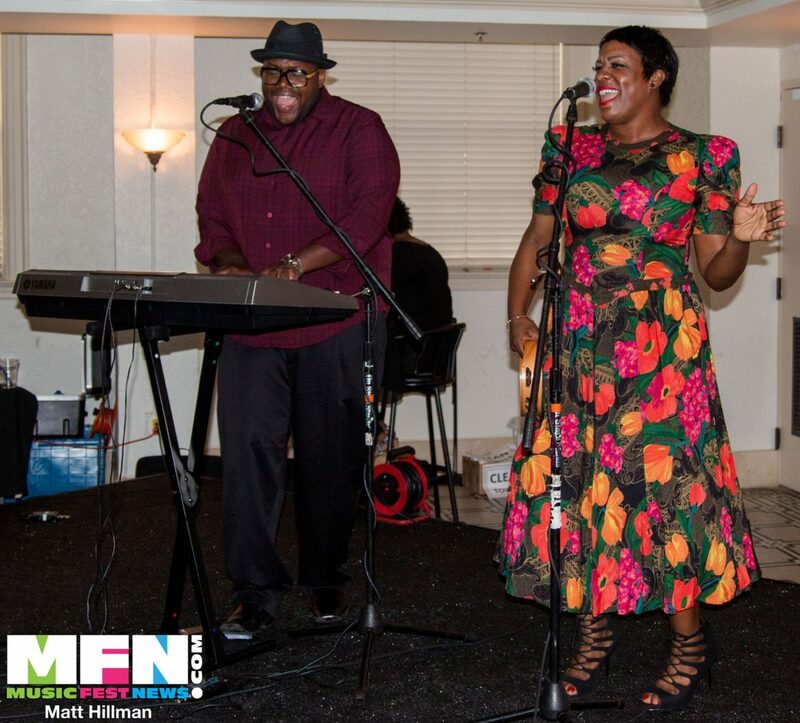 A husband-and-wife duo (Michael Trotter Jr and Tanya Trotter) out of Baltimore, they sing very high energy Americana/soul with a very gospel-infused sound. Their powerhouse vocals are backed with nothing more than a simple keyboard and occasional violin, but they still generate a sound that had everybody dancing and smiling. Their lyrics are equally as powerful as their sound, with their songs conveying themes such as racism, social inequality and, above all, a sense of community and love. Barely Pink played a special tribute to the late David Bowie by performing Ziggy Stardust at Crowbar. It was the only time I’ve ever seen Crowbar at capacity with at one point over 30 people standing outside hoping to get in. I’d never even heard of this band before. 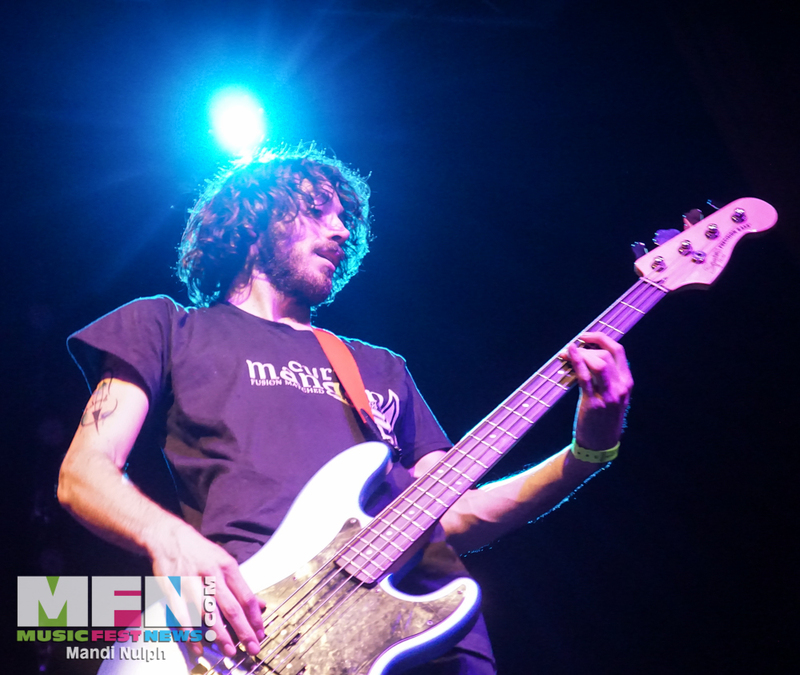 They are based out of St. Peterburg and consist of Brian Merrill on vocals, Mark Warren and Dan LaJoy on guitars, Michael Hoag on bass and Ricky Wilcox on drums. I came in and fought my way through the heavy crowd to get right up front in time for them to go into “Starman.” I got chills as I realized this would be the closest I would likely ever get to hearing Bowie play this song. The band was on fire, hitting the jangling but powerful guitar notes with the drum and bass lines constantly driving the song forward. Merrill’s vocals were on point with just the right amount of reverb, giving them the ethereal sound Bowie so often had. When they launched into “Suffragette City,” I was standing outside looking in, and it was one of those moments where you can see the entire crowd bouncing up and down in unison, and you just feel the connection between the crowd, the band and the music. It was another goosebump moment. When half a dozen different musicians and venue owners all tell you to go see an act, you tend to listen. 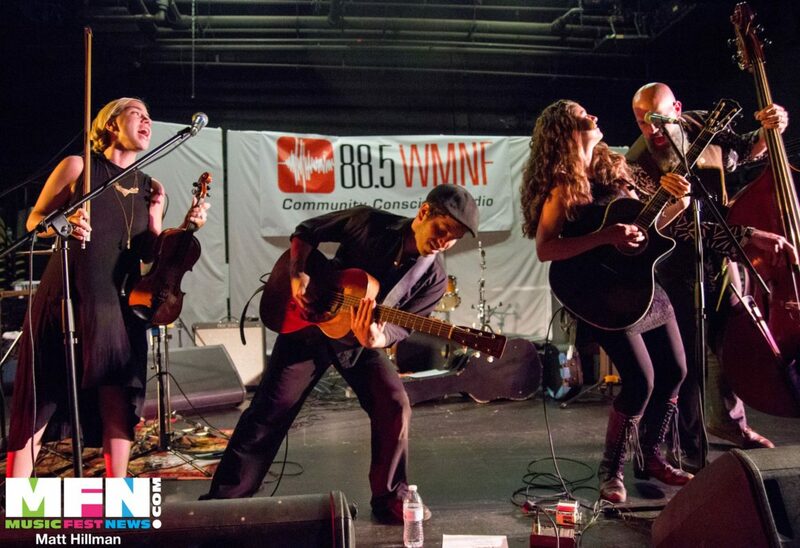 Such was the case with Caravan Of Thieves, a four-piece band that marries gypsy, Americana, stomp and swing fronted by husband and wife Fuzz and Carrie Sangiovanni. They have a unique sound, as eclectic as their name suggests. They clearly have a vaudeville influence in their music and the way they engage the crowd. The upstairs at The Italian Club was packed, and I saw at least half the people singing every word. I was told that the fiddle player and upright bass player were new additions, but they have clearly meshed well with Fuzz and Carrie, since we would never have been able to tell. James McMurty had a stage presence that was very intimidating. He has a very gutteral growl when he sings. He has a Johnny Cash thing going on in that he is very baseline and intense when he plays. That’s what really stuck with me. The Bright Light Social Hour were extremely energetic (really hard to photograph because the lead singer moves around so much… but, oh, that hair!). I had never heard of them before, but my friends were very insistent that we see them, and I am glad we did. 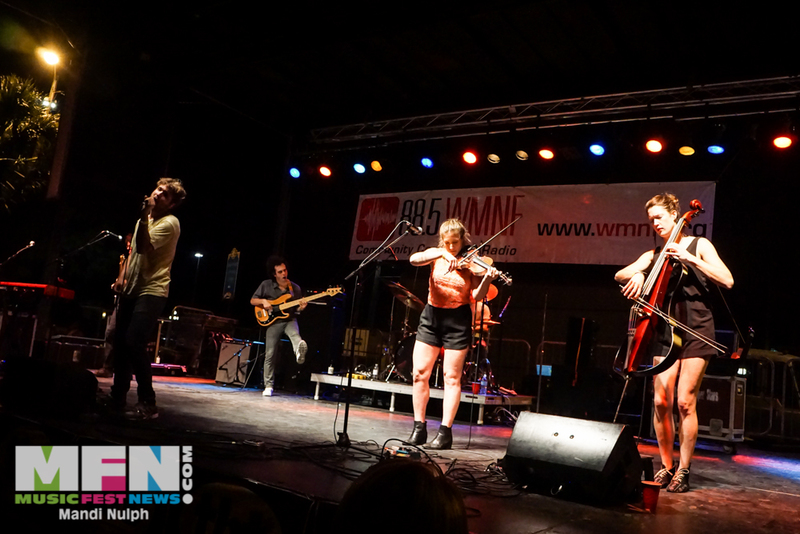 They hit that sweet spot between grungy rock and folk pop that is very popular now, and I feel like they could really hit the festival circuit hard in the next year and be really popular with that crowd. They really channel that ‘60s psych rock that seems to not only influence their sound but also their style. Lots of reverb. It was really fun. I met the lead singer’s mom. She was hilarious! I just dropped in an out for Pretty Voices, but they had a nice crowd for New World Brewery. 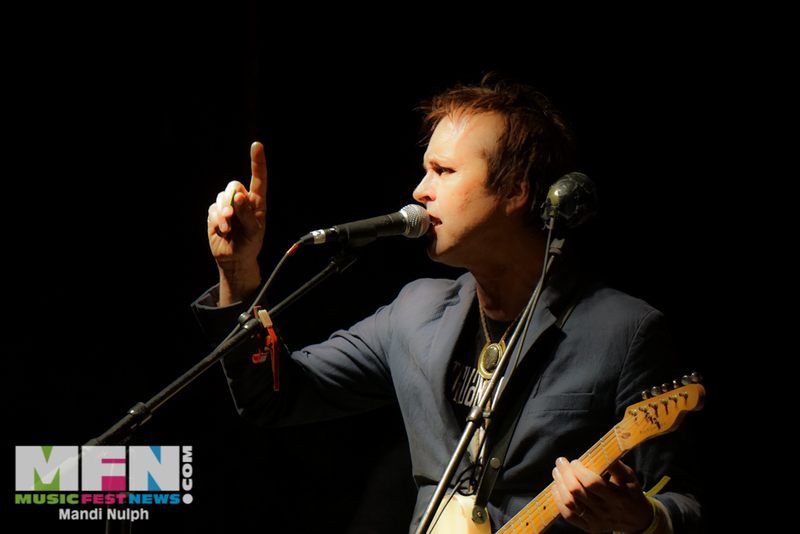 Chuck Prophet was another artist I had never seen and was also recommended to me. I really liked how melancholy he sounded. I’m having a hard time describing his sound, but it was one of those sets where you just kinda stand where you are, close your eyes, and sway to the music and let it take your imagination away. Like a soundtrack to your thoughts. It reminds me of Tom Petty. Dash Rip Rock were pure fun. Very soulful rock, and the lead singer liked to move around a lot, which I always like to watch (but hate to photograph, especially in the dark!). 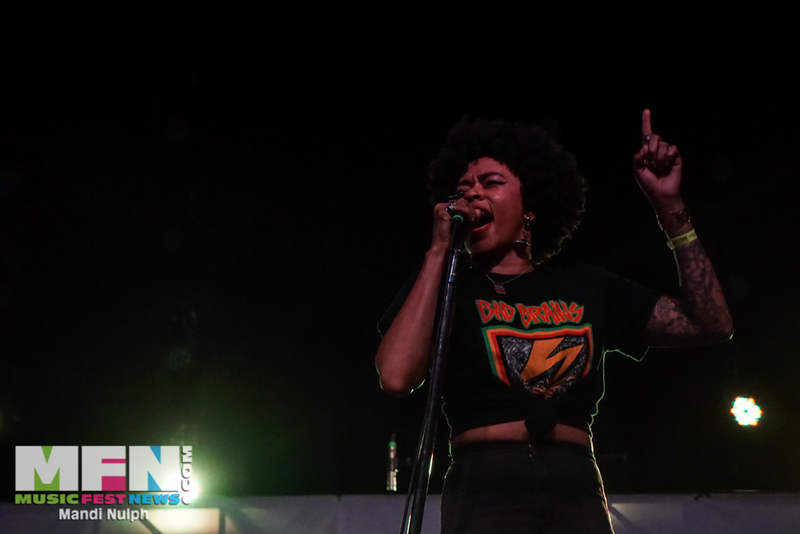 Nikki Hill was also a lot of fun to watch, a high-energy, soulful R&B singer. Her band was super funky. I have always love Ra Ra Riot. They have such a great mix of sounds, and the lead singer sounds a lot like a band I used to work for. They have a really great pop/folk thing going on. Super high energy and full of emotion and soul, but also very serene. Great use of strings. Though I think they stopped playing like 45 minutes early. The were scheduled to go until a little after 1, and I think they stopped before 12:30. So that was kind of a bummer. 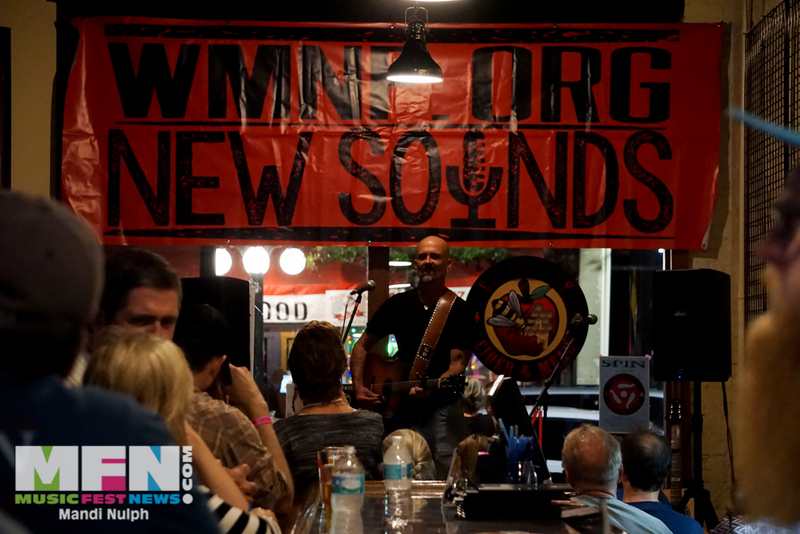 Thanks again to WMNF for bringing such diverse music styles together for one wonderful evening.